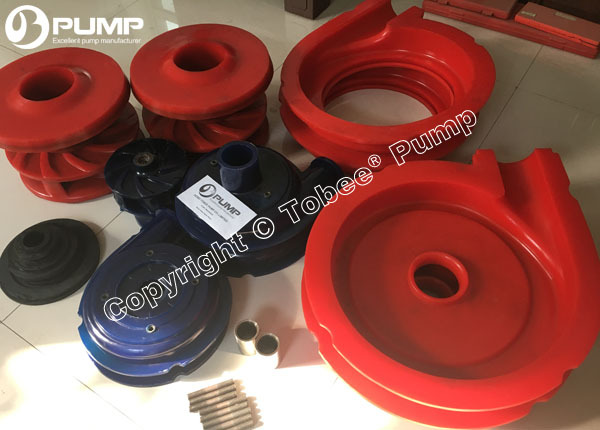 Tobee® Slurry Pump Polyurethane Spare Parts directly contact with slurries, It is very crucial to the service life of slurry pumps. The worklife of Polyurethane parts is longer than Rubber materials for 3~5 times, Polyurethane wetted parts include Impeller,Throatbush, Frame plate liner, Cover plate liner, Frame plate liner insert etc. They are very easily worn-out components because they work under longtime impact of abrasive and corrosive slurries. For the long service life of pump parts, Polyurethane material plays an important role here. • Wide range of hardness - With the high hardness, The Polyurethane parts still have the good elongation and elasticity, The hardness of Polyurethane parts is at Shore A10-D80. • High wear resisting - Anti-resistant performance is from 0.01-0.10（cm3）/1.61km, Duration will be longer 3-5 times than rubber. • High strength - Break strength and bearing capacity is higher than rubber. • Oil resistance: As a kind of high molecular compound, it is almost incorruptible. • Gadiation resistance: Polyurethane parts have high gadiation resistance, It still have good performance at 10-10Gy radiation dose. PU01 is an erosion resistant material that performs well in elastomer applications where 'tramp' is a problem. This is attributed to the high tear and tensile strength of PU01. However, its general erosion resistance is inferior to that of natural rubber (RU26, RU08). 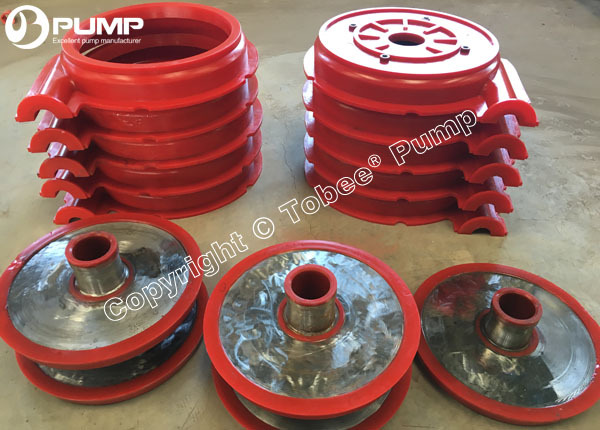 Tobee® Pump is always making continuous optimization of materials like Cast steel, EPDM, Hypalon, Hastelloy, CD4MCu, Viton, Fluoroplastic, Ceramic, Bronze, Titanium, Aluminum and other anti-abrasive & corosive materials for various applications. 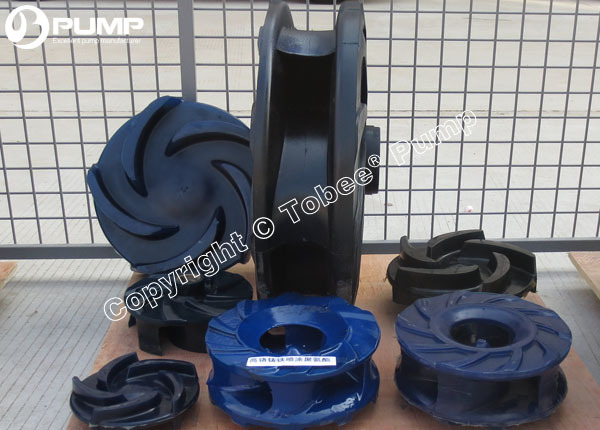 Tobee® Polyurethane Slurry Pump Parts are widely used for Centrifugal horizontal polyurethane slurry pumps, Vertical polyurethane slurry pumps, AH polyurethane slurry pumps, Chemical slurry pumps, Silica sand slurry pumps, Tunnelling slurry pumps, Minerals processing slurry pumps, De-Watering Screen Pump, Ore sand pumps, Tailings Pump, Mineral Sands pumps, Pipe-jacking slurry pumps, Ball mill discharge Pump, Mixing tank slurry Pump, Wet crushers slurry pumps, SAG mill discharge pumps, Ball mill discharge pumps, Rod mill discharge slurry pumps, Ni acid slurry pumps, Coarse sand pumps, Coarse tailings pumps, Phosphate matrix slurry pumps, Scrubber slurry Pump, Minerals concentrate pumps, Heavy media slurry pumps, Dredging Sand slurry pumps, Bottom ash slurry pumps, Fly ash pumps, Lime grinding pumps, Screen feed Pump, Oil sands pumps, Fine tailings pumps, Tailings booster Pump, Thickner Tailings Pump, Process recycle Pump, Pipeline transfer pumps, Phosphoric acid slurry pumps, Coal slurry pumps, Flotation pumps.